In a deep skillet, add about 1/4 inch of canola oil. Heat over just below medium heat for 15 minutes. Add the pretzels to the bowl of a food processor and pulse until most of the mixture is pulverized (you'll want to leave some small-ish pieces). Transfer to a bowl. Add the eggs to another bowl, and the flour to a third bowl. Season the flour with salt and pepper, and mix well. Once the oil is hot, rinse the chicken tenders in cool water. Then, dredge into flour, then egg, then the pretzel mixture. Place into the skillet. Cook for 2-3 minutes per side, until golden outside and cooked through. For best results, only cook two tenders at a time. Repeat these steps until all of the strips have been cooked. Transfer the cooked tenders to a paper towel-lined plate. Serve with your dipping sauce of choice. Don’t call these kid-food. 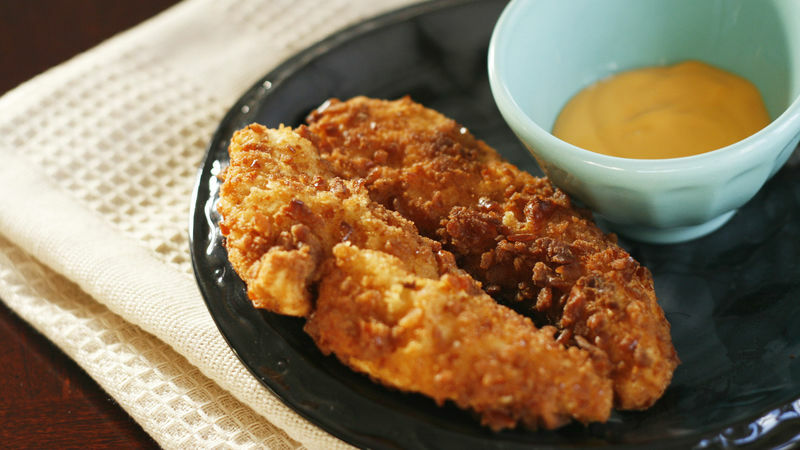 These Pretzel Crusted Chicken Fingers are fun enough for the kids, and delicious enough for the adults. Everyone can enjoy biting into these juicy, mouthwatering strips. We’ve been talking mash-ups a lot here at Tablespoon lately, and this is a mash-up of my own: pretzels and chicken fingers. Instead of breadcrumbs, the chicken is coated in crushed pretzels, giving it a fabulous, flavorful coating that is so good you barely need to dip it. Of course, dipping is super fun. Really, I am an advocate for dipping. With these Pretzel Crusted Chicken Fingers, I like cheddar cheese dip. You can find it in the chip aisle along with the pretzels. I usually opt for mild cheddar cheese dip, since everyone in the family will eat it. But salsa con queso (salsa with cheese) is another fab option. Want a different dip? Try honey barbecue sauce or honey mustard. Sweet and sour sauce (aka duck sauce) could work too. The chicken fingers are fried in well-heated oil, which means they cook up fast and super juicy. Drain them on paper towels before serving. Oh, and for best results, only cook two at a time – because they cook so fast, any more than that takes you away from the pan too long, meaning that some get a little more done. So, what would you like to dip these babies into?